In search of the former village’s now heavy-traffic small town’s secret, it may be best to begin at its undoubtedly most enigmatic spot: the Tulum ruins. Squatting on 12-meter-tall cliffs at the northern end of town, the site faces the ocean towards the east and the sunrise. Below the great pyramid, the surface of the water reaches out towards the horizon in hundreds of shades of green and blue, only disturbed by the white-capped waves breaking at the barrier reef – the largest in the Western Hemisphere – in front. Accompanied by a dazzling variety of multi-coloured sea animals, the coral formation wriggles and trails along the coastline like a giant sea-snake guarding the place. Apart from the stunning view, a dip into the fresh water can be enjoyed at the ruin’s own little beach at the foot of the cliffs easily accessible by a wooden staircase. More Mayan mystery can be discovered in the so-called cenotes – sinkholes connected by a complex tunnel- and river-system that constitute the huge underwater cave system permeating the Yucatan Peninsula. Some cenotes resemble open air pools, while others form underground caves featuring stalactites and stalagmites. The prevailing theory about their origin maintains that they are formed by dissolution and collapse of the region’s limestone ground. Serving as water supply and, in former times, places for worshipping, the cenotes have always represented a vital part of local life. According to the old beliefs, they connect the upper world with the divine realm beneath. In order to please the Gods, offerings and human sacrifices used to be thrown into the openings. Their spooky past is reflected in the baffling, sometimes eerie beauty they surprise their visitors with. Floating or snorkelling through the entrance of a cave, half-obscured by foliage pierced with sunlight, into its gloomy hall, discarding the merciless heat of the tropical summer in the cool, crystal clear water, makes a trip to one of many cenote parks in the region indispensable. The Grand Cenote, Dos Ojos, Cenote Escondido and Cenote Azul belong to the best-known spots offering guided tours as well as snorkel equipment for rent. More natural wonders reveal themselves at the Sian Ka’an Biosphere, United Nations World Heritage site and Mexico’s largest protected marine biosphere. A day-trip into its arcane solitude of wildlife diversity offers not only the opportunity to experience an unforgettable eco-adventure watching birds, kayaking through hidden canals and snorkelling in pristine waters, but also to get in contact with modern Mayan communities in the villages inside. 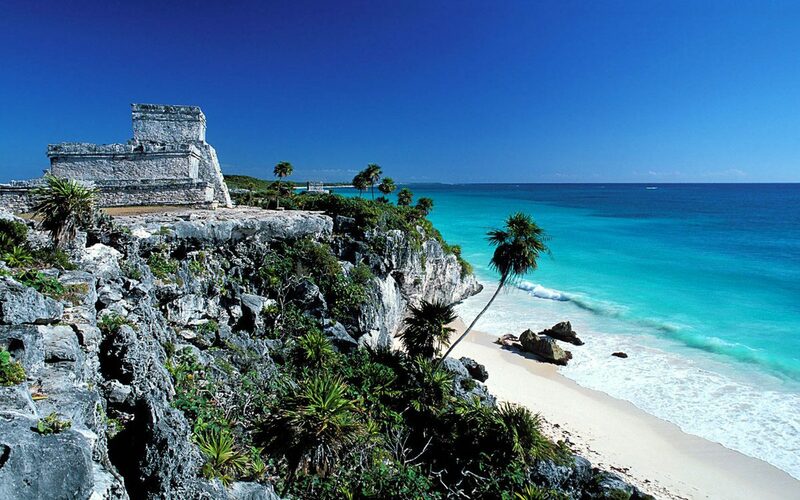 Less secretive, but highly marvellous as well: Tulum’s incomparable beach-life! However, laying around doing nothing is hardly an option. Apart from a large scale of mundane activities like kitesurfing, reef-diving and -snorkelling and even high sea fishing, it is all about Yoga, exotic spa-therapies, unlocking the wisdom within and finding your true inner path. Especially on the beachline’s more exquisite south side, Yoga-classes and therapy-sessions are a part of Tulum’s eco-chic hotel-life as innate as housekeeping. Amongs many others, Sanara, Casa Violeta and Yoga Shala offer a wide range of classes and services on the holistic side of wellness. The strong eco-ethic practised by most of the beach resorts accentuates the chilled out yoga-atmosphere at Tulum beach: according to a strict low-rise policy, the great majority of buildings are beach cabins run by solar power which means that after ten o’clock, there is only candle- and flashlight leading the way through the sandy pathways connecting buildings and beach to each other. All of this does not mean that there is a shortage of worldly pleasures in Tulum. On the contrary: as a healthy spirit creates a healthy body, the body is strong enough to create thriving business. As happening in Tulum, first of all: the culinary. Food has reached a level that can easily compete with any big-city cuisine-temple. In the beach zone, this is certainly true for the meanwhile almost legendary Hartwood, jungle-sided, wood-fired, with its famous agave-rips and the obligatory, very trendy queue in the afternoons to get reservations down for the evening. But there are other options worth giving a try. For instance, The Real Coconut by Sanara offering exiting health-food in a cool beachfront ambient and the Mezzanine’s Thai food served with a stunning ocen-view. Those who want to stay out after dinner, should proceed into town and try one or two of the yummy Mojito-variations at Batey, easily recognizable by the sugarcane grinder accommodated in a multi-coloured Mini parked outside, and later enjoy some live music at the Curandero just on the other side of the main avenue. Or come directly out to dine in the pueblo. Ginger Hotel gives a taste of contemporary Mexican food and features delicious vegetarian, grain- and gluten-free options. Two blocks further into town, Cetli restaurant awaits its guests with Yucatan high cuisine in an authentic homely atmosphere. Ten points for its amazing choice of moles and the tamarind Margarita! It is impossible to leave paradise without taking a piece of it back home. Tulum’s ever growing shopping options make it easy to get rid of leftover holiday money while enjoying the stunning diversity of Mexican handcraft. Lovely souvenir shops like Mixik and MexicArte seduce the eye with colour-bursting selections of anything from blankets and ponchos to jewellery and crockery. And, of course: hammocks! Most Mayans prefer them to beds and the certainly serve to bring back the ultimate feeling of Caribbean relaxation to the homely garden. The Weary Traveler Hostel right next to Cetli restaurant offers a fine selection of handmade hammocks and – exhibiting its very own weaving equipment – gives interesting insight into the production process and maybe even into the secret of Tulum: to be heavenly simple and infinitely complex at the same time. Situated a good hour and a half from buzzing Cancun, Tulum is easiest to get to through Cancun Airport. All major airlines offer daily flights from most airports in the United States. Virgin Atlantic flies directly from London, Condor and Lufthansa directly from various airports in Germany, Air France from Paris, Air Canada from Vancouver and Toronto. At the airport, most well-known car rentals offer their services, and there are plenty of Shuttle services but most do many stops in the way. For those who prefer to just lean back and relax, it is better to book a private car service. A well-known upscale provider for Tulum transfers is Tucan Kin with a fleet of top of the notch SUVs and a semi-shared Eco-service (especially designed to cut down emissions) with no stops between Cancun Airport and Tulum Hotel Zone. Next Next post: Wanna Kiteboard? Let’s Go to Tulum!